Oh, the weather outside is frightful, and the kids are not delightful! Looking for something to help your kids calm down and relax when they are cooped up indoors because of the cold weather outside? 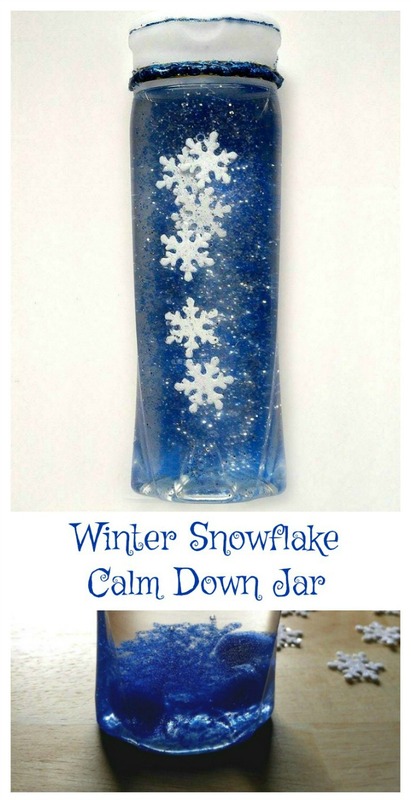 Try this Winter Snowflake Calm Down Jar. This relaxing project is as easy to make as they come. In a few minutes, you’ll have a fun jar that the kids can shake. 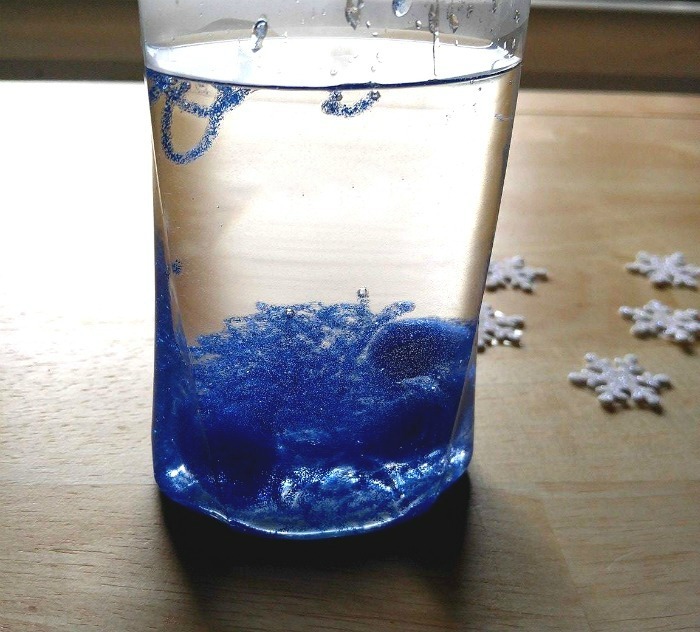 They will love to see the snowflakes floating down in the midst of the blue glitter gel. It’s sort of like a Christmas snow globe effect. Remember how you used to feel when you shook one of those and the snowflakes floated over a pretty scene? This is my version of that for the winter months. Let’s make a Winter Snowflake Calm Down Jar! (This post contains affiliate links for your crafting experience.) Just assemble your supplies. 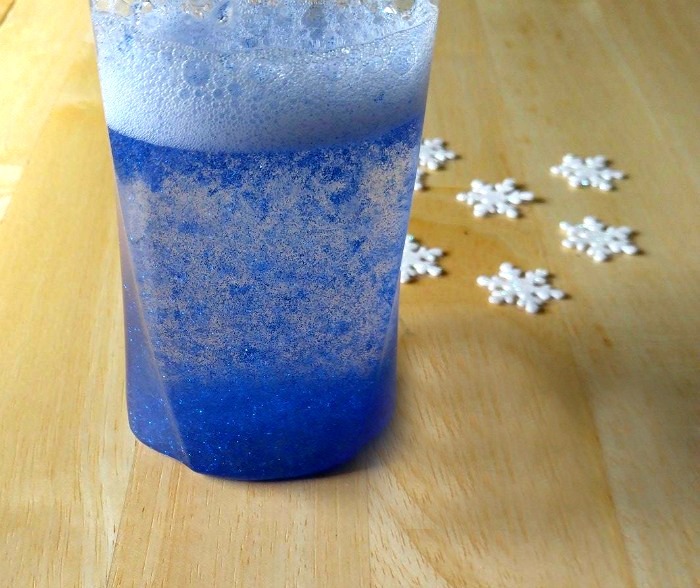 To make this Winter Snowflake Relaxation Jar, you will need the following. 1 clear jar. I used an empty shampoo bottle with the labels removed. Other options are Voss Water bottles, or any plain clean jar. Be sure it has a decently wide opening. If you use a shampoo bottle, like I did, clean out the shampoo and wash the bottle thoroughly several times to remove all of the contents. Then remove the jar label and get rid of the residue with Goo Gone. Fill the bottle about 1/2 way with very hot tap water. NOTE: Cold water will keep the glitter glue from mixing with the water, so be sure the water is hot. 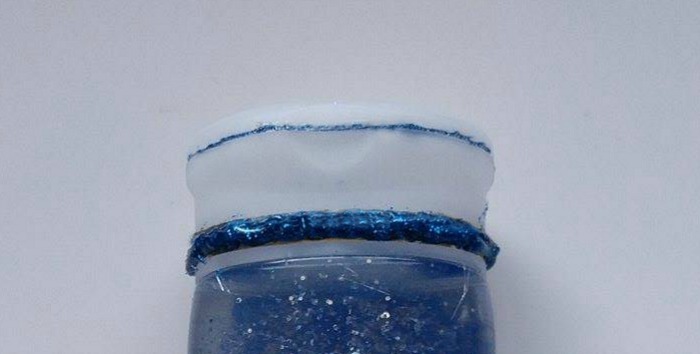 Add the contents of a 5.4 oz bottle of blue glitter glue. The glue will come out in a big tube if you remove the cap and you can replace it to get the last remnants of the glue in smaller strings. 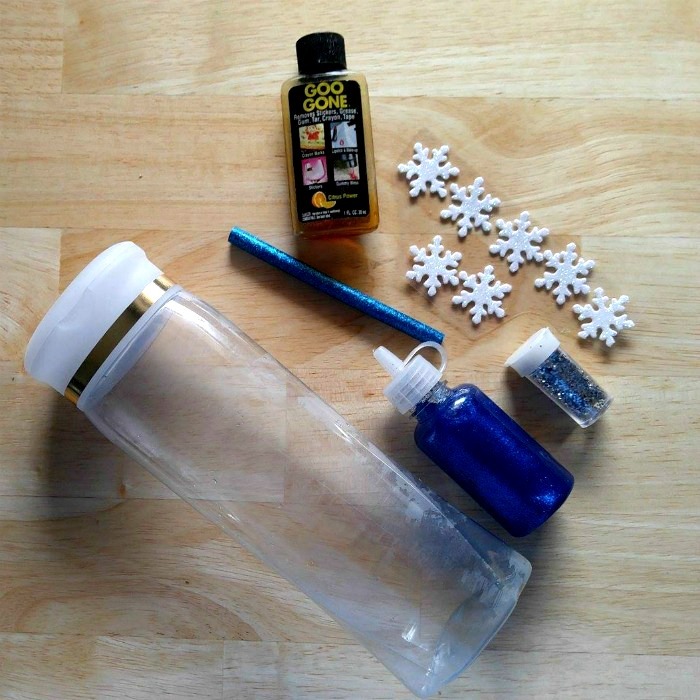 Replace the cap of the water bottle and shake the bottle to mix the blue glitter glue. Add about 1/2 of a very small tube of silver glitter. Replace the cap and shake again to mix in the silver glitter. The blue glitter glue has glitter in it, but adding some more gives more for the children to watch as it swirls around. 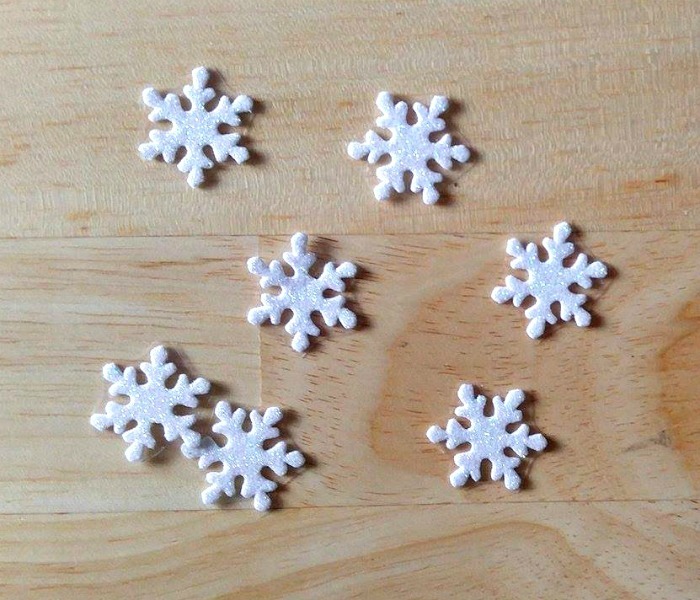 Trim the snowflake stickers. I left the plastic backing on them to give them a bit more weight and to keep the glitter from attaching itself to them. 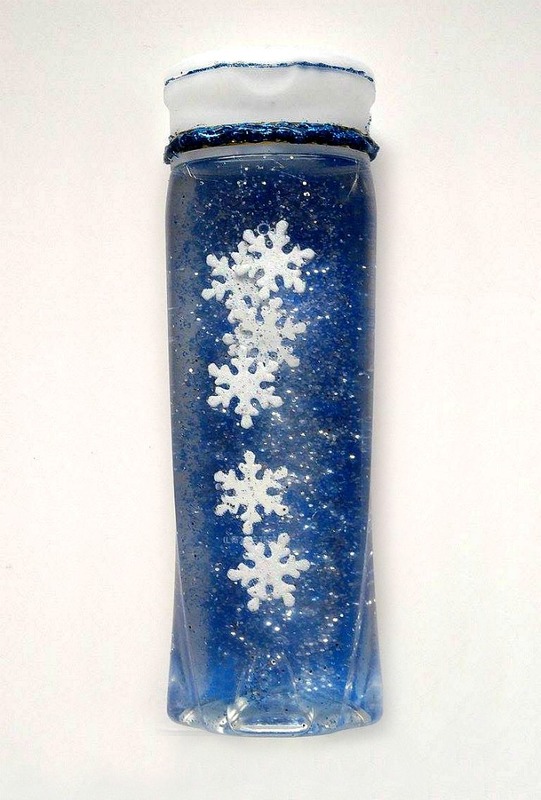 Fill the bottle to the top with hot water and place the trimmed snowflakes in the bottle. You will notice that they just sit on the top of the water. This is because they are so light. But they will move around inside when your child moves the bottle around. 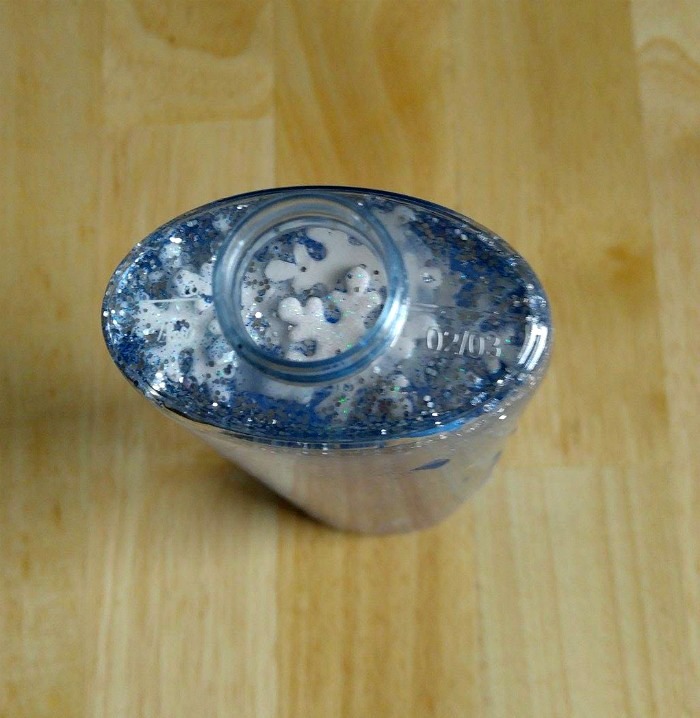 Insert a blue glitter glue stick into a hot glue gun and seal around the edges of the top of the bottle. THIS IS IMPORTANT. If you don’t seal the bottle closed, your child may be able to open the bottle. At the least, it will make a mess. Worst case scenario, they might drink it!! I also used the blue glitter glue stick to decorate around the gold ring that was left on my bottle after I removed the shampoo. 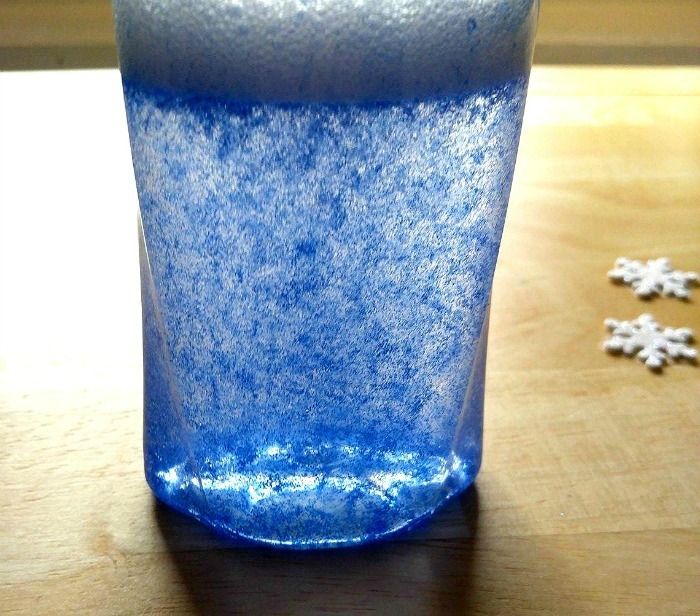 But when your child shakes the bottle and turns upside down, and then upright again, they will have a lovely blue glitter effect with falling snowflakes. 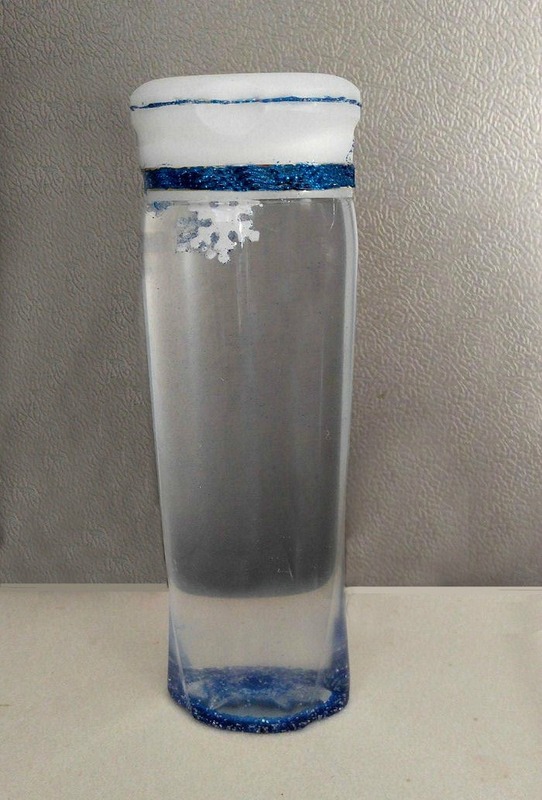 Also, the snowflakes will sit in different parts of the bottle, depending on how it is held. So much fun, so relaxing and so effective at calming down your child on a cold winter’s day indoors! I can see why these calm down bottles work. I actually found it relaxing to make the project. Each time I shook the bottle, I felt a sense of relaxation. Admin note: this post for the snowflake calm down jar project first appeared on the blog in January of 2017. I have updated the post to include a printable craft project card and a video for you to enjoy. 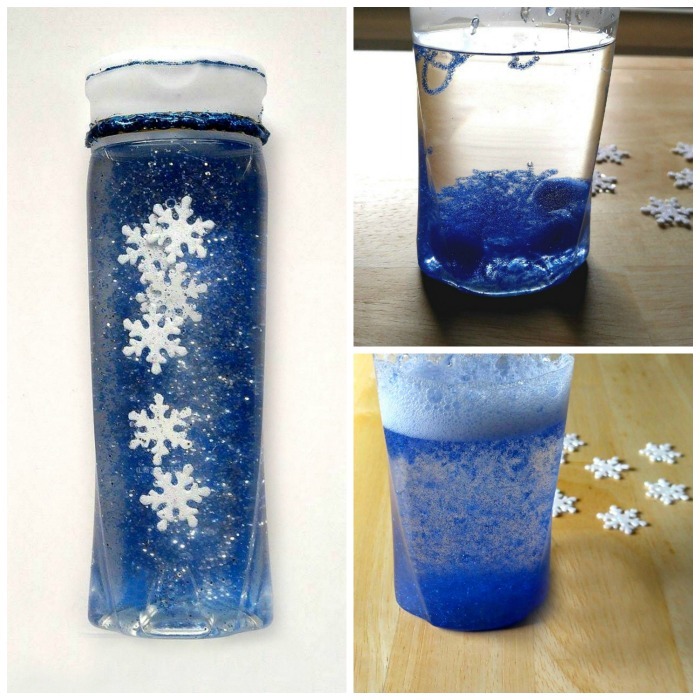 This winter snowflake calm down jar will be a fun activity that will really keep the kids occupied and quiet them down. Clean the bottle and allow to dry. Use Goo Gone to remove the label and residue. Fill the bottle 1/2 full with very hot water. Add the contents of the blue glitter glue. Replace the cap and shake to distribute. Add about 1/2 of a small tube of silver glitter. Replace cap and shake again. Trim the snowflakes so most of the excess backing is removed but leave the backing on the back of the actual stickers so the glue doesn't stick to them. Add hot water to fill the jar and place the stickers in the jar. 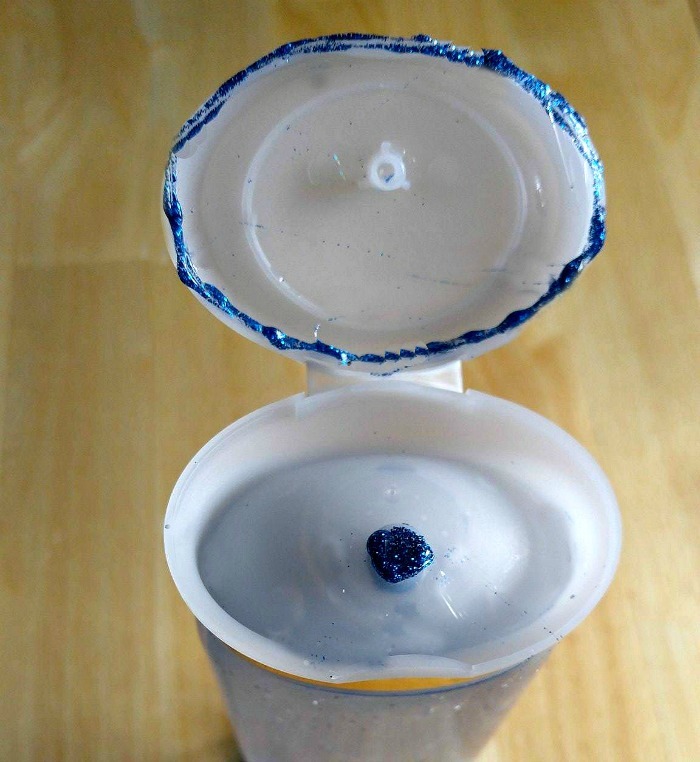 Use a blue glitter stick to seal the top so that it can't be opened by your child.